We are electing our representatives for the central government today. Who we vote for will determine the Prime minister. The choices are not great but the event itself is quite a spectacle. The 2014 Lok Sabha elections is happening in 9 phases spread over a month and we in Chennai fall into phase 6 today. I come under the South Chennai constituency and within that there are various sub-sub-sub parts that determine where I queue up. Considering South Chennai has 3.5 million voters and the country has 81,45,00,000 people on its electoral roll its quite a management miracle. I went with my grandmother who is 85 years old and determined to exercise her right. Our polling booth was in a corporation school and 10 residential areas have to come here to vote. The open quadrangle had ten different queues snaking around under the shamiyanas. I had thought I would have plenty of time to dash off many sketches but thanks to my grandmother I was given red carpet treatment. A security guard ushered us in and we were out in five minutes! Actually all the queues were moving pretty fast. 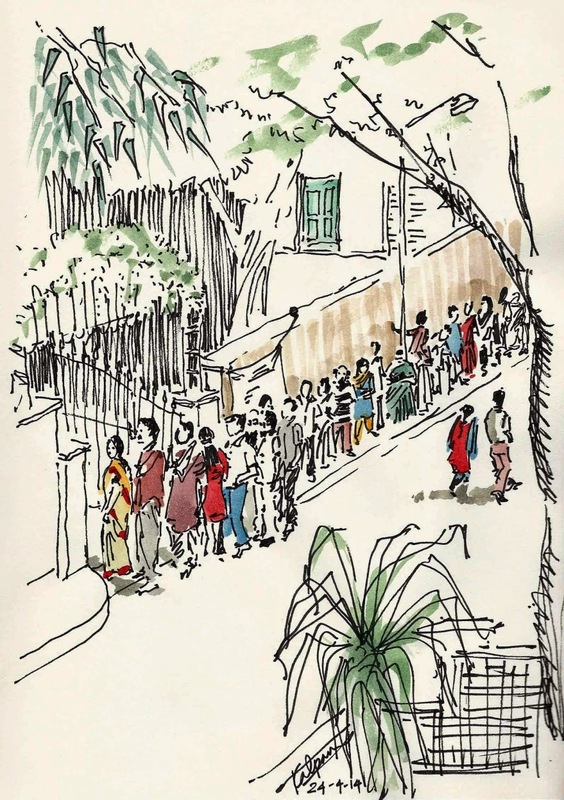 Earlier in the morning I sketched another line of folks waiting to vote in Mylapore just outside my house. This was around 8 in the morning and the line was very very long. Generally the lines are much longer before office starts. All the schools and colleges have to shut as they become polling booths and counting centres. I am impressed to see you posting this one within a couple of hours of casting your vote. 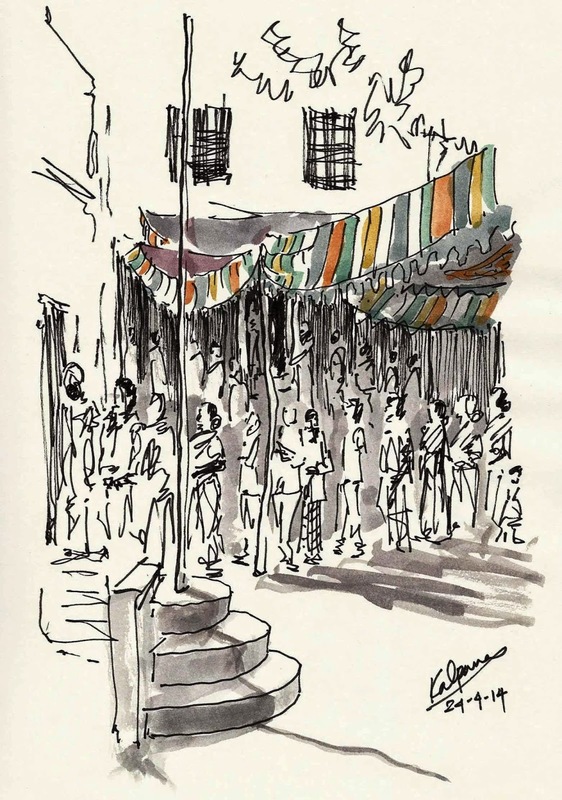 Your sketches reflect the impressions that I formed when I was at the polling booth today. It was crowded, but it was also very orderly and the process was very streamlined. There were multiple queues at the polling centre and I had about 30 to 40 people ahead of me in my queue. And yet I was out in less than 15 minutes. Considering the mindboggling number of parties, candidates, voters and voting centres involved, the way the logistics of our elections is managed and the entire process itself is something that India can be really proud of. Unfortunately the people that we elect have not lived up to our expectations in the past.